Size: 13" Case price at any Quanity! 17" Case price at any Quanity! 24" Case price at any Quanity! 36" Case price at any Quanity! 42" Case price at any Quanity! 44" Case price at any Quanity! 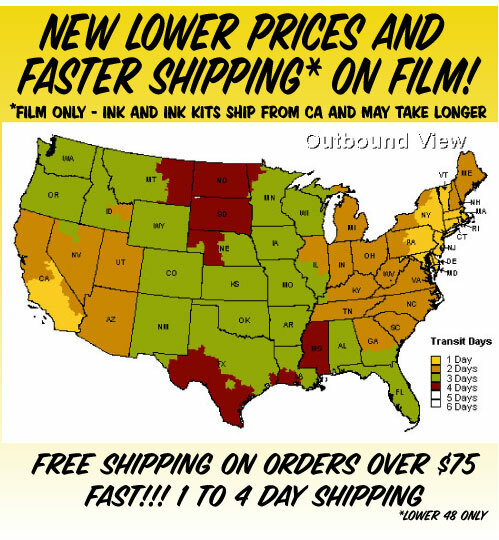 We are now shipping film from CA and NJ. So with few exceptions we cover the whole country in 3 days or less! It has never been easier or more affordable to produce quality film positives from an inkjet printer. Our FD film is a direct positive waterproof film with quick drying capability. FD film meets the most demanding requirements of screen printers who are interested in using their inkjets for imaging color separations. With a thickness of 4 mils and a micro-porous coating technology that controls dot gain, UV characteristics, and drying, FD is perfect for color separations. Manufactured for use with piezo printers, FD Film offers a Visual dMax of 4.0, a UV dMax of 3.7 and a dMin of .07. This is the only film I use anymore. It’s crystal clear and hold fine detail perfect . I found FilmDirectOnline.com through a Google search in looking for a new film supplier, after the company I was using had been bought out, leading to a product with diminished quality. I placed one order with FilmDirectOnline.com and was extremely happy with the quality of this film! It is packaged well, runs smoothly through our Epson 4900 printer, and you simply cannot beat the film price, shipping turnaround, and shipping time! Not to mention the free shipping! We have now gone through 12+ rolls of film so far and we will be a forever customer!